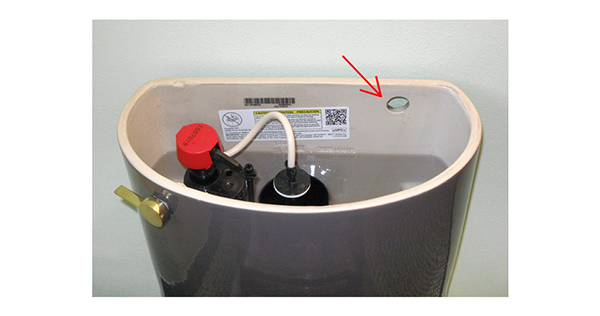 Some toilet tanks may have a hole near the top of the tank. The hole is an intentional part of the tank design to aid the drying process during manufacturing. Certain toilet bowls have a small “frost” hole located in the front of the bowl just below the rim. The hole allows residual water from water-leak testing to exit the siphon jet chamber. The toilet bowls are stored upside down to ensure water drainage prior to shipment. In cold weather, the frost hole prevents water from freezing inside the bowl. Some toilets contain a hole in the trapway area behind the bowl. This hole is part of the design aesthetic of the toilet.